The first dwellers here established a base around the source of the Eure. The Romans, attracted by the spring's flow, drew upon it to provide fresh water to the rapidly expanding town of Nîmes, and a 50 km-long aqueduct was designed and built during the first century AD… but that is another story! 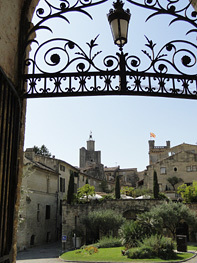 From the fifth century, Uzès started to grow, and the town was host, until the 19th century, to a powerful bishopric, regrouping up to 200 parishes. Steeped in Protestant religion, the city took sides with the French Reformation movement and suffered greatly during the Religious Wars, with a great many churches and temples being destroyed. Amongst these was the Cathedral of Saint-Théodorit, which was rebuilt in 1632, retaining its original bell tower. The picturesque Fenestrelle tower, with its round bell tower, dates back to the 12th century and remains one of the city's most iconic symbols. During the 16th century, the count Antoine de Crussol was bestowed the title of Duke and in 1632, Uzès became the 1st duchy of France. The castle, symbol of Uzès (and inhabited to this day by the de Crussol family, is a harmonious blend of architecture and ornaments from different periods of French history: it features thousand-year old caves, feudal towers (the Tour de Bermonde, the Tour du Roi and the Tour de l'Evêché), ramparts, a Renaissance façade featuring Ionic, Doric and Corinthian elements, an 18th-century façade… The castle’s apartments house fascinating collections of furniture and ornaments. From the top of the Tour Bermonde, you can enjoy superb views over the Uzège. 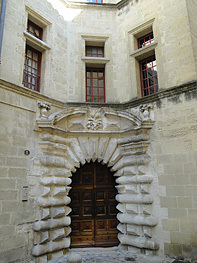 Listed as a 'Town of Arts and History', Uzès began to refurbish its centre from 1965. It is an irresistibly attractive city, with its many narrow cobbled streets and its charming façades dating back to the 16th and 17th centuries. 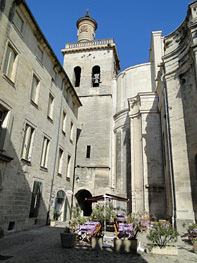 The main square, the Place aux Herbes, and its arcades play hosts to the town's various markets. The museum Georges-Borias presents different collections, forming an accurate image of the past and heritage of Uzès and its region. A visit to the museum also provides the opportunity to discover the grand rooms of the ancient bishop's palace. You can also enjoy visits to the Haras National (the French national stud farm) and, of course, the Haribo sweet factory - unmissable for all children (big and small…)!